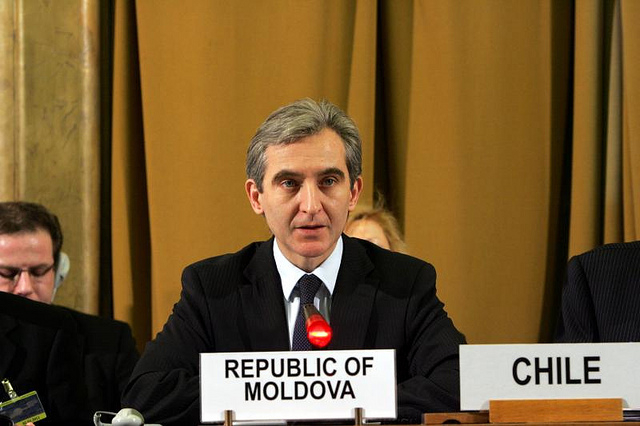 Iurie Leanca, the Prime Minister of Moldova, said that his country prefers transparency and direct contacts with Russia, rather than Twitter diplomacy, alluding to an episode in which the Russian deputy prime minister Dmitry Rogozin tweeted that his country could act in the Moldovan region of Transnistria “as in Crimea” if “people’s security” was threatened. Leanca, who paid a visit to Commission President José Manuel Barroso Thursday (15 May), said his country had nothing to hide from Moscow, in its effort to seek closer relations with the EU. Moldova will sign its Association Agreement with the EU on 27 June, in the sidelines of the summer EU summit, Barroso announced. The EU-Moldova Association Agreement is coupled with a “Deep and Comprehensive Free Trade Agreement” (DCFTA) similar to the one negotiated with Ukraine, which prompted Russia’s to destabilise its neighbour. “Our European integration should not be precluded from enhancing, improving, (and) enriching our relations with the Russian Federation, because it’s a very important partner for Moldova,” Leanca said. He added that Chisinau took the view that between the DCFTA and the country’s free-trade arrangements with Russia, in the framework of the Community of Independent States (CIS), there were “no incompatibilities”. Leanca also said that he was looking forward to meeting the Russian Prime Minister Dmitry Medvedev, in order to discuss “our plans for the future”. Moldova will hold parliamentary elections on 30 November, and Russia is trying to mobilise support for the country’s Communist Party, which strongly opposes EU integration. Russia says Moldova should first hold elections, and decide whether to sign the Association Agreement afterwards. Russian deputy prime minister Dmitry Rogozin visited Transnistria, a Russia-controlled breakaway region of Moldova during the weekend, and warned that Moscow’s relations with Chisinau will not remain the same if Moldova seals the Association Agreement. Rogozin, who is on the EU and US sanctions list, caused a furor on Twitter over his trip to Transnistria, when his special plane was prevented from flying from Tiraspol to Moscow via Romanian territory. Rogozin arrived in the Transnistria city for the 9 May celebrations of Victory Day, overflying Bulgarian and Romanian territory, because Ukraine didn’t allow his special plane to cross its airspace, EURACTIV was told by air controllers. On the way to Tiraspol, he twitted that he was flying despite the ban, and reported that Ukrainian fighter jets had intercepted his plane [read more]. But the attempt to return was aborted, because this time Romania didn’t allow the plane transporting Rogozin into its airspace. Reportedly, the USA had in the meantime put pressure on Bucharest that it had to abide by the sanctions decided at EU level. Rogozin tweeted that upon US request, Romania has closed its airspace for his plane. “Next time I’ll fly on board TU-160”, he tweeted. The TU-160 is a Cold War-era Russian bomber aircraft. The short message caused outrage in Romania. “Russia won’t act in Transnistria as in Crimea unless local people’s security’s threatened”, Rogozin tweeted over his Tiraspol visit. “We should discuss our bilateral agenda not through Twitter, not through Facebook accounts, but in a very direct way, by meeting at various levels. We have nothing to hide about our own agenda. We are very open, we are very transparent,” Leanca said, in an indirect response to Rogozin. Barroso said that the EU found it unacceptable for Russia to pressure the Union’s Eastern partners, adding that such policy was against the principles of the 1975 Helsinki agreement, creating the Organisation for Security and Cooperation in Europe, which served as the basis for peaceful coexistence for the final decades of the Cold War. “Even in Cold War, the principle of the right of one country to engage in negotiation with another country was accepted,” Barroso said. The Commission President repeated his plea that the doctrine of limited sovereignty had no place in the 21st century [read more]. He argued that the Association agreements which the EU intends to sign with Ukraine, Moldova and Georgia are not “against someone”, “they are for something positive”. Barroso also insisted that the Commission and Moldova had “fully informed” Russia about the agreements. “They have to recognise that independent countries have the right not only of self-determination, but of negotiating and agreeing whatever agreement they want with other countries. If not, if you accept the other principle [that Russia has the right of veto], we are heading for trouble, not only in the region, but in the world,” Barroso said.